A grand production is expected to take place this Friday and Saturday as Gloria Gaynor will give us a flashback of the disco era. 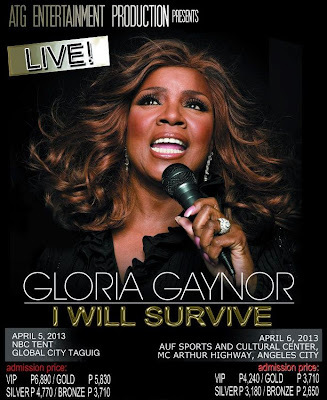 She will be performing her hit songs Can’t Take My Eyes Off You, I Am What I Am and the popular song I Will Survive, among others. Remember how you used to sing I Will Survive after a breakup or make a boring party a night to remember? Gloria Gaynor continues to ride the success of the song, touring the world and performing on dozens of TV shows. Now I can’t wait to witness this song LIVE from Gloria herself. In signature Gaynor fashion, expect a night with variety of sounds-- encompassing upbeat dance-pop and classic-sounding soul-- bringing you to the dancefloor and letting you swing to iconic beats. 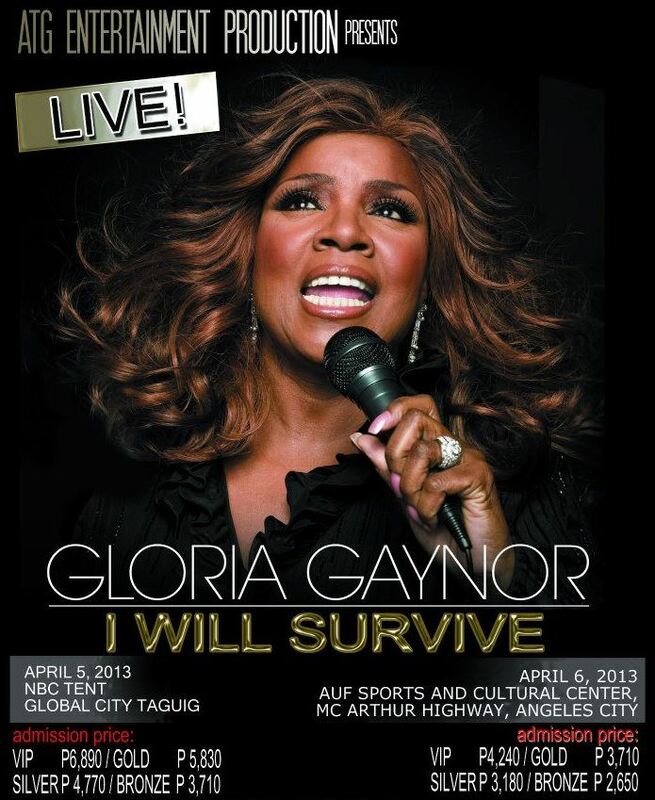 “GLORIA GAYNOR: I Will Survive” is on April 5, 2013 at the NBC Tent, Global City Taguig and April 6, 2013 at the AUF Sports and Cultural Center, McArthur Highway, Angeles City presented by ATG Entertainment Productions.